Saturday morning, 27th June, dawned bright, sunny and dry for the FROG 2 training day at Charlton. Outside (!) the historic Anchor and Hope pub, Lorna and Nathalie prepared for a dry day. 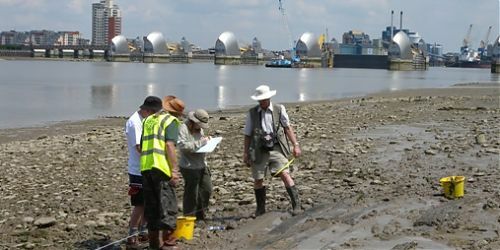 They expected to get perfect access to the archaeological features during the period before and after low water at midday. Two film crews were on hand for the momentous day. 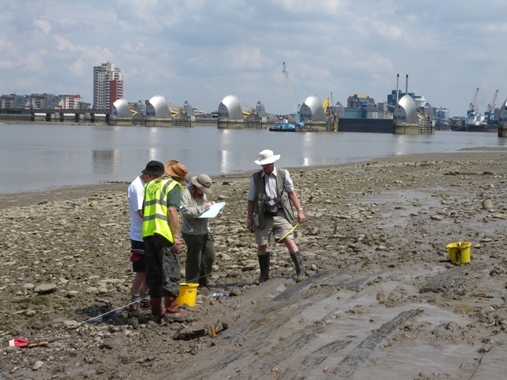 Unfortunately, no one had spoken to the Thames, which overnight had deposited a thick layer of light brown mud on the whole of the foreshore. This meant that walking about was very squishy, and features needed quite a lot of cleaning before they could be recorded. The archaeologists needed quite a lot of cleaning afterwards. The timbers in my section, Area 327, appeared to have been coated in liquid milk chocolate, and work was delayed while ultimately unsuccessful efforts were made to get some water to flush the surface mud away (the deep mud between us and the river meant that we could not make use of water from the Thames). We did however succeed in scraping off the worst of it, so that Jennifer was able to draw plans of some of the timbers, and Pip and I were able to complete the necessary Timber Recording Sheets. During the process, I took a series of digital photographs of Contexts 100 and 101 for TDP to share. Work was then curtailed by the tide, which chased us off the foreshore and into the Anchor and Hope for refreshment. TDP believes that the timbers in Area 327 have come from a barge or barges, and that they were later reused to form a slipway into the river.